From the curated newsfeed of Damn Interesting, we learn that astronomers by reverse engineering present conditions and vectors have worked out that the Solar System was grazed by a passing red dwarf some seventy thousand years ago. 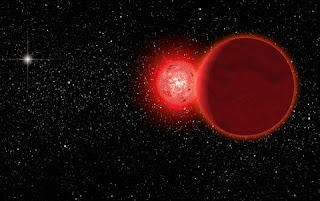 Though fifty thousand times further than the Sun is from the Earth, the flyby of Scholz’s star (named for its discoverer Ralf-Dieter Scholz of the Leibniz-Institute for Astrophysics in Potsdam who also worked out the prehistoric trajectory) came within one light year’s distance and was probably visible as a dim red smudge in the night sky. The red dwarf is also suspected to be a binary system, paired with a non-luminous, invisible brown dwarf, or giant planet and those gravitational disruptions the visiting star caused will eventually—in about another million years—send a volley of comets into the inner Solar System. It’s an intriguing comfort to know that humans and Neanderthals that shared the Earth looked up and into the night and made up stories about what that red, marauding blur might be—but that mythology is only conjecture, just as how humans or other beings might interpret the omens of those future comets.